While my father was serving in the Marines in the South Pacific during World War II, my mother sent him photos of herself with little love notes written on the back. The bubble bath and sunbathing poses are legendary in my family. This one was taken at McKee Bridge on the Applegate River on June 27, 1943. 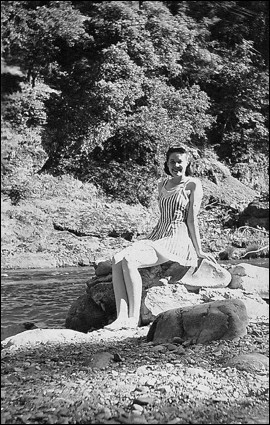 Mom wrote on the back: "Here's your darlin' wife, honey -- that smile and pose are just especially for you, 'cause I love you!!"